Bill attended Bismarck Junior College and finished his degree at the University of Minnesota in Minneapolis. He had one year of ROTC training at the U of M and five years of training in Mandan with the 188th Field Artillery Unit of the ND National Guard. He was employed by the postal service at Mandan. He learned to fly at Eielson Field at Mandan in 1938. 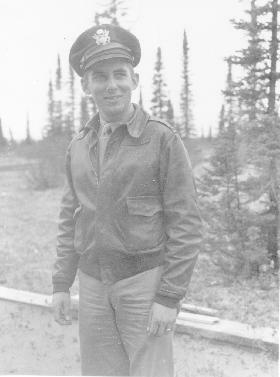 Broderick was appointed an aviation cadet in the Army Air Corps on July 11, 1941, prior to which he was at Fort Warren WY with Mandan's Battery A 188th Field Artillery. Following his appointment as an aviation cadet, he received primary flight training at Grider Field, Pine Bluff, AR and basic flying training at Bush Field, Augusta GA. From Bush Field he was transferred to Barksdale for advanced training. He received his silver pilot's wings and a commission as a second lieutenant in the US Army Air Corps at graduation exercises at Barksdale Field, LA. Lieutenant Broderick was a member of the third and last wartime class of pilots to graduate from Barksdale Field which has been changed from a pilot training school to a base for combat units. Broderick was promoted to first lieutenant in September 1942. First stationed at a weather station in Greenland, we went to England before going to Africa. He was shot down over Tunisia on February 4, 1943 and captured. Initially he was sent to Stalag III in Germany where conditions were relatively comfortable. However after the Allied armies pushed into France and eventually Germany itself, prisoners of war (POWs) were consolidated into camps in central Germany. The overcrowding made conditions truly terrible. Broderick and 10,000 other POWs were marched from their camp in late January 1945 in winter blizzard conditions. They were eventually loaded 50 to a 40-and-8 boxcar for a tortuous three day rail trip to Stalag VII A in Moosburg Germany. He remained there until freed with 130,000 Allied prisoners of war (including 30,000 other Americans) on April 29, 1945. 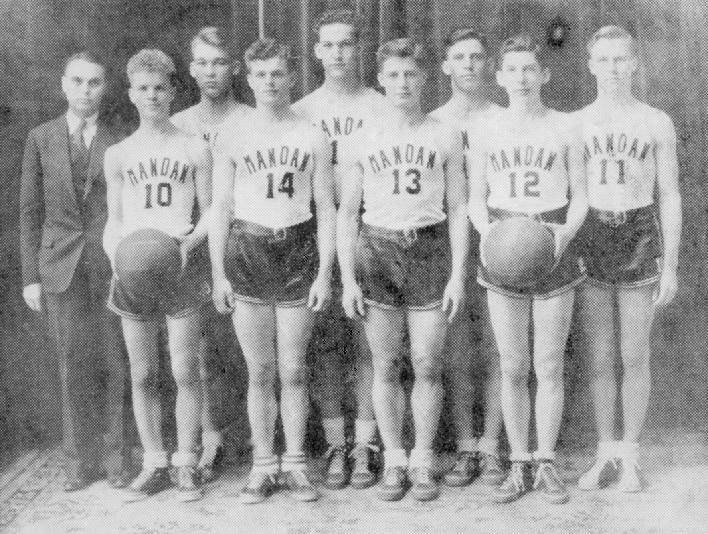 He returned to his family in Mandan on June 3, 1945 a scant 110 pounds in size. Despite his objections, his mother insisted he attend the wedding of Margaret Kennelly and Charles Murphy. Margaret's twin sister Mary Ellen had known William's younger brother John, also a pilot but killed-in-action in January 1945. Mary Ellen took Bill in hand during the event. Two weeks later the couple was engaged and married one month later. The couple honeymooned at a rest camp in California. Mary Ellen and Bill would have three children, sons Thomas and William Jr. as well as a daughter Colleen. Upon his discharge that fall, he enrolled at the University of Minnesota. He graduated in 1951 with his medical degree. He subsequently began his internship at Stanislanus County Hospital in Medesto, California. He and his family remained there where he practiced as a general and family doctor for over 45 years. In 1956, William married Nancy Smith in Modesto and William adopted the three children from her prior marriage: Joan, Sheldon and John Smith. Dr. Broderick worked with the city of Modesto to pioneer programs for protecting employees from the long-term effects of exposure to agricultural and industrial chemicals. He was also a teacher in Stanford Medical Center's primary care associate program. William Broderick participated in several state and local medical societies. He was also a member of the Elks, the Del Rio Country Club and the Modesto Duck Club. He continued flying throughout his life. He survived several crashes, including one in a form field in Oakdale, CA in 1962. He also served as an aviation medical examiner for the US Federal Aviation Administration. Dr. Broderick died on August 13, 2001 at the age of 83 at the hospital he helped to found, Doctor's Medical Center in Modesto, CA. He is buried in Modesto. The Society appreciates the assistance from MHSoc life member Mary Broderick-Harris for sharing this information on her brother with us.